Nirmal, who is a teacher at a government school, was travelling in an auto rickshaw when the two men on bike snatched her purse and fled in Uttar Pradesh's Hathras. The theives were caught at the petrol pump and beaten up by the people. 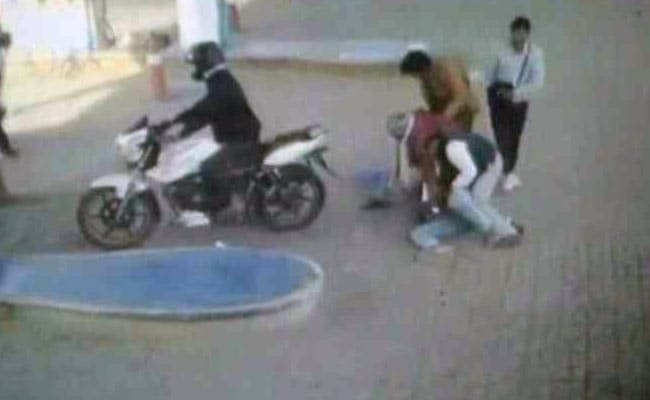 In a dramatic chase, two thieves were caught after their bike ran out of petrol in Uttar Pradesh's Hathras. Nirmal, who is a teacher at a government school, was travelling in an auto rickshaw when the two men on bike snatched her purse and fled. A school principal Arun Kaushik who was behind that auto-rickshaw in his vehicle chased the two and also informed the police on the way. "I quietly followed the thieves. There was no number plate on their bike and its rear tyre was also punctured. When the two stopped at a petrol pump, I, with the help of other staff members at the fuel pump, caught hold of them and got them arrested," Mr Kaushik told news agency ANI. In the CCTV footage, the principal and other staff members can be seen overpowering the thieves at the petrol pump and beating them up. The two were later handed over to the police. A pistol has also been recovered from the thieves.